According to reports from news study published by the American reference scientific journals, eggs in the diet are more than welcome and are definitely recommended. Specifically they are some of the few foods that can be called a "super food" because they are rich in nutrients, some of which are extremely rare. Survey on nutrition have shown that nearly 90 percent of the population of USA eats less than the recommended daily intake of choline, and one chicken egg contains more than 100 mg of this important nutrient. So that is the question "whether the eggs are healthy," the answer is certainly yes. How to prepare them, how they affect the skin, hair, nails, immune system, what is their caloric value find out below. We will present the nine benefits of chicken eggs that have been confirmed by a number of studies. Also contains a substantial amount of vitamin D, E, K, B6, calcium, zinc, and 77 calories (average), 6 g of protein and 5 g of healthy fats. Indeed, the eggs in the diet are the best choice, because they contain a bit of almost every nutrient we need. Of course, it should be remembered that the healthiest and most nutritious is the one organically produced. Among other things, they have more omega-3 fatty acids and many more vitamins A and E. Insufficient intake of vitamin D in the organism causes weakening of bones in children and adults, increasing the risk of developing diabetes, Crohn's disease, multiple sclerosis, asthma, certain cancers and many other serious diseases. Even 90 percent of the nutrients get through the sun, but the skin absorbs only if it is not protected by sunscreen. The problem is particularly acute in the winter months, and vitamin D should be introduced into the body through food, significantly with boiled eggs. Therefore, include this food in the menu of the day and prevent a variety of problems. One study conducted in Copenhagen has shown that people who ate for six weeks two eggs a day - increased levels of good cholesterol by 10 percent. Choline is an important nutrient, which most people do not know it exists. This is very important substance often grouped with B vitamins, and essential in building cell membranes and plays a role in the production of signaling molecules in the brain, as well as many other features. Survey on nutrition have shown that about 90 percent of people in the United States consume into the body less than the recommended daily intake of choline, and one egg contains more than 100 mg of this important nutrient. Therefore, eggs in the diet are extremely important. It is known that a high level of bad cholesterol is associated with greater risk of cardiovascular illnesses, in particular heart attack. What most people do not know is that there are subtypes of bad cholesterol, depending on the size of molecules. Numerous studies have shown that people with cholesterol have a higher risk of developing a heart disease than those with large particles of bad cholesterol. Although eggs in the have the tendency to slightly raise bad cholesterol levels in some people, studies show the particles change from small to large, as well. As we age, our vision becomes worse. Several nutrients can suppress some of degenerative processes on the eyes, and in this group lutein and zeaxanthin are included, a powerful antioxidants, which are accumulating in the retina of the eye. Studies have shown that by taking optimal amounts of these nutrients you can significantly reduce the risk of cataracts and macular degeneration of the eye. 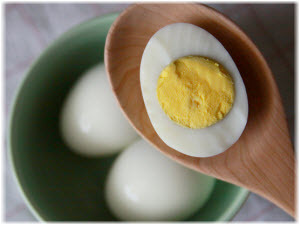 Egg yolks contain a large amount of lutein and zeaxanthin. In a controlled test, consuming only 1.3 yolks a day for four and a half weeks has raised the levels of lutein in the blood from 28 percent to 50 percent and zeaxanthin from 114 to 142 percent. Eggs are also rich in vitamin A, whose deficiency can cause blindness. Except for the elderly increasingly are recommended eggs in the diet of infants and young children. It is important to say that the nutritional value of some eggs varies depending on how the chicks are fed and how they are raised. Eggs from chickens that are raised on pastures and meadows and who ate foods rich in omega-3 fatty acids - are usually richer in these nutrients. It is known that omega-3 fats lower triglycerides in the blood, a known cause of heart disease. One survey in the Seychelles found that consuming just five eggs rich in omega-3 fatty acids per week - for three weeks - lowered triglycerides by 16 to 18 percent. How much protein does one egg contain? The basic structure of the human body consists of proteins, so it is very important to enter it into the body in sufficient amounts. One large egg contains 6 grams of this nutrient, as well as all essential amino acids in adequate measure, but our body is equipped to use proteins. The optimum amount of protein can help in weight loss process to increase muscle mass, lower blood pressure, strengthen bones, and more. Eggs in the diet are high on a scale called the "satiety index" which measures the ability of foods to cause a feeling of fullness and reduce caloric intake. In one study, 30 obese women are eggs for breakfast instead of rolls, they have increased the feeling of fullness and reduced calorie intake the next 36 hours. In another study, substitute was egg rolls, for eight weeks led to significant weight loss. Studies have shown it is safe to eat three eggs a day. There is no evidence that it is more harmful, but it is still uncharted territory. Indeed, eggs are the perfect natural foods. In addition, they are cheap, easy to prepare and delicious. In addition to all the above mentioned things, we should mention that eggs are very important for the health of hair and skin because they contain a high percentage of sulphur, which is important for collagen synthesis. Also, this valuable food contains vitamins B-group, and other minerals and vitamins that make hair shiny and firm. It is no wonder why so many natural cosmetic products contain eggs. WHAT IS THE LIFE SPAN OF EGGS? Always buy fresh eggs, but if you are forced to take them in supermarkets, be sure to see when they are packed. The eggs in the diet can be used after three to four weeks after purchase, provided that you keep them in your fridge. Always check their smell before any use. Council plus: a raw egg store in the coldest part of your refrigerator, it's a much better option than to place them closer to the door itself. Freezing raw eggs is not recommended.